MOTHERHOUSE's mission is to "make an international brand with developing countries". We wanted to provide opportunities where you can see the wonderful resources and potential in countries otherwise simply defined as "developing countries." We believe we have shown the potential of developing countries to customers through our bags and stoles. Still, there is much more that can be discovered about these countries by actually going, witnessing with your own eyes, and speaking with the locals who live there. Eventually, we came up with the idea to allow anyone to visit our factory and experience working side-by-side with our workers to design and create a truly unique bag or stole. In these tours, you can experience the fun, difficulties, and possibilities of manufacturing in developing countries. Raise silkworms, spin thread, make cloth, and dye. You can experience the whole process with our craftsmen. It will be a precious experience to look into the product and also yourself through tracing the origins of its manufacturing. 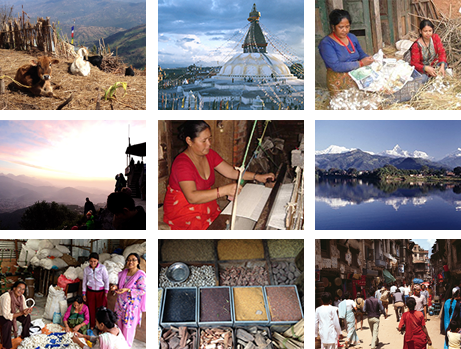 Intersted in seeing the lush nature of Nepal, making a stole from the most natural materials? Start by finding materials at a local market, then design your bag. Soon you'll be communicating with Bangladeshi craftsmen however possible, creating a one-of-a-kind bag. Try experiencing deeper local communication than any other tour through the manufacturing process. Making a bag will give a shape to the potential of Bangladesh and always remind you of the great memories from the trip. We are temporarily suspending acceptance of applications. Study Tour Desk, H.I.S. Co., Ltd.
Due to recent public safety concerns, all applications for Bangladesh tour are suspended until further notice.